This year our family is celebrating Thanksgiving with my husband's family. I am looking forward to waking up on Thanksgiving and watching the Macy's Thanksgiving Day parade then heading out to visit family. 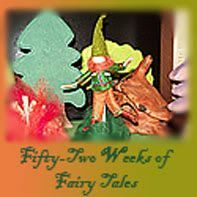 Even though I am not hosting the Thanksgiving meal I still like to put out Thanksgiving decorations, so I thought I would share some of the decorations that I put up this year. 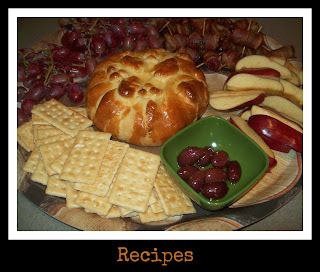 I also thought I would share two Thanksgiving leftover recipes. 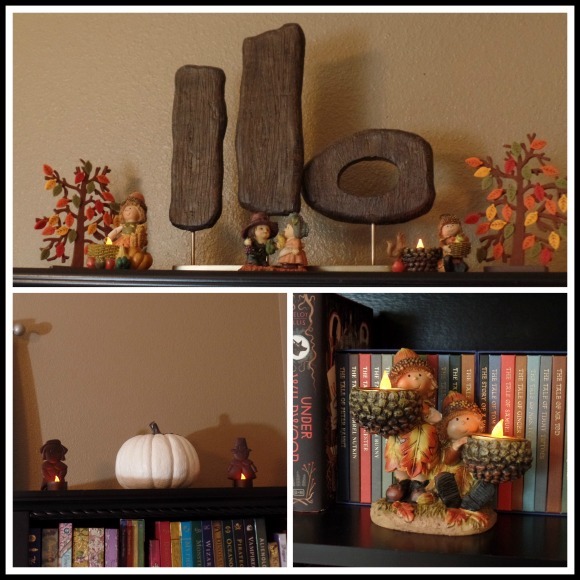 This year I added some fun new wooden signs to my Thanksgiving decor, I found the signs in the Target Dollar Spot for $3.00 each, which I think is a great deal. I paired the wooden signs with candle holders I already had, as well as a few animal figures and of course my Thanksgiving Snoopy. 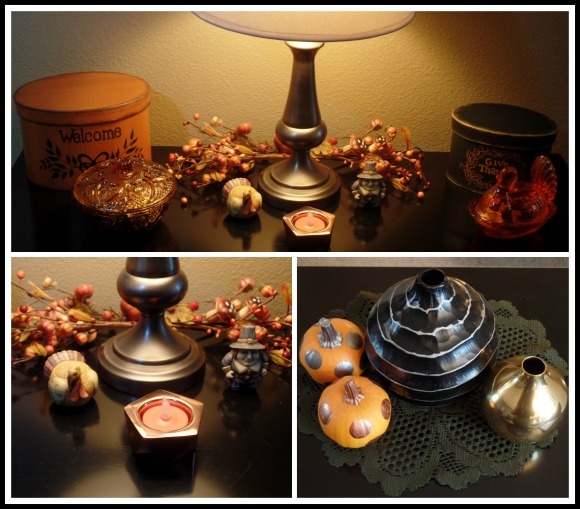 I used a lot of the same decor as previous years, in addition to using all of the pumpkins that I painted with metallic paint for Halloween. On my bookcases I tucked in my little Thanksgiving figurines that I have had for awhile now. 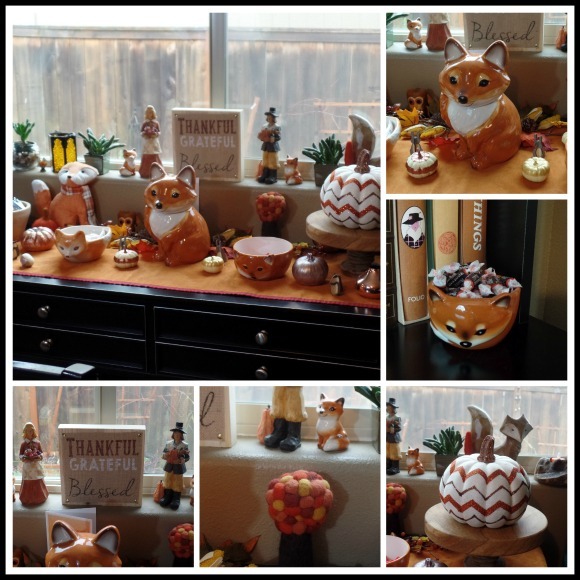 I also had fun decorating with some of the cute fox decor that I found at Walmart earlier this fall. Since I am not hosting Thanksgiving this year I decided to cook a turkey last week so we could still have our favorite Thanksgiving foods as well as our leftover meals. I cooked the turkey from a frozen solid state following directions I found online. I have always wanted to experiment with that and it worked out great. I was very careful to remove the plastic giblet bag as soon as the turkey thawed enough to remove it. Of course the Turkey took a lot longer to cook, but we were in no hurry. 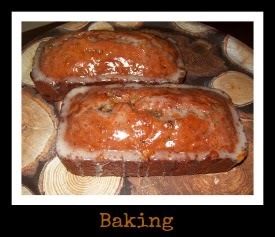 I was glad to have tried out the method, it worked great and I did not have the fuss of thawing out my turkey. I made stuffing, mashed potatoes, gravy, brussel sprouts, and mushrooms, and we also had canned cranberry sauce, and rolls. Everything was yummy. I love using all the turkey meat in leftover dinner recipes. 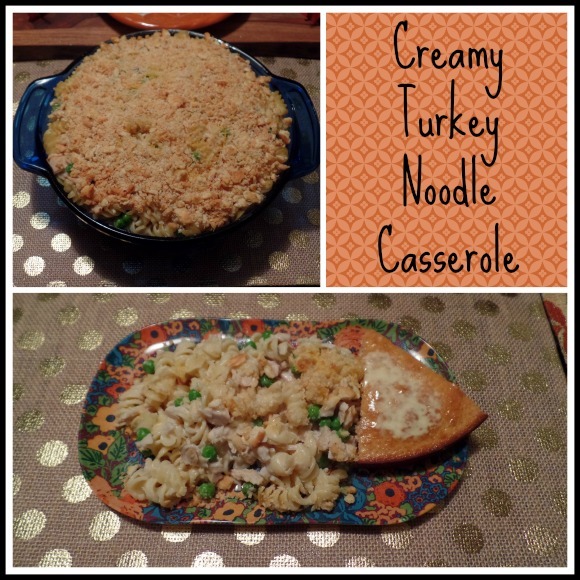 This year I made one of my favorites- Creamy Turkey Noodle Casserole. 1 pound Rotini pasta, 2 cups chopped cooked turkey, 1 can cream of mushroom soup, 1 soup can of milk, rounded half cup of grated cheddar jack cheese, half a bag of frozen green peas, salt, pepper, 15 Ritz crackers, 1 rounded Tablespoon Parmesan, 1 1/2 Tablespoons of olive oil. while the pasta is cooking chop up about two cups of leftover cooked turkey into small cubes. Return drained pasta to pan, add turkey, one can cream of mushroom soup, 1 soup can of milk, half a bag of frozen green peas, and a rounded half cup of cheddar jack shredded cheese (add a bit more if you like cheese), add salt and pepper to taste. Stir until combined then transfer to a greased casserole dish. For the topping crush about 15 Ritz crackers in a small Ziploc bag, add a rounded tablespoon of grated Parmesan (just the sort in a jar), and about a tablespoon and a tablespoon and a half of olive oil, seal the Ziploc bag and shake until combined, then top the casserole with the crumble mixture. Bake the casserole at 350 F. until the casserole is heated through and the crumble topping is golden brown, about 25 minutes. 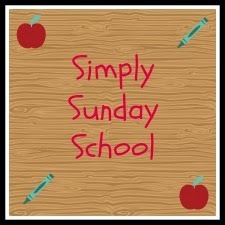 I like to serve casseroles with extra veggies and sometimes a muffin or apple bread side dish. 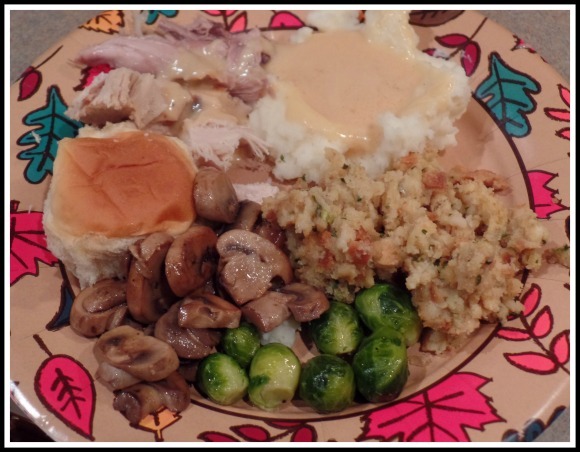 The next night I made a family favorite Thanksgiving leftover- Turkey and Stuffing Roll-Ups. 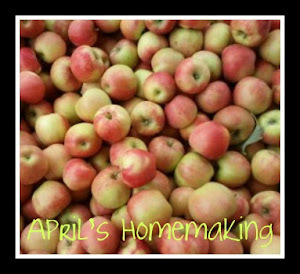 I came up with this recipe a couple of years ago, and it is always yummy. 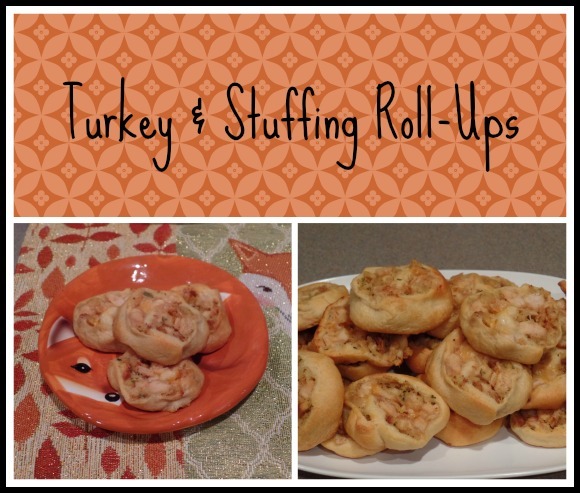 Here is a link to my Turkey and Stuffing Roll-Up Recipe. I have been thoroughly enjoying all of the fall weather we have been having, the cooler temperatures have finally arrived and along with it, it is seems we have quite a few more birds in our garden. Last week I was sitting at my computer and kept hearing the cutest little chirping going on in my front yard, so I thought I would take a peek. I was surprised to see all of my burberry bushes filled with the cutest little birds flying around so quickly you could hardly catch a glimpse. Upon closer inspection I realized they were bushtits. I got my camera and tried to get a couple of good pictures through the window, they were so fast it was tricky but I managed to get a couple. Bushtits are so tiny, the body is only about an inch long, the tail is about another inch as well. I just love these birds! 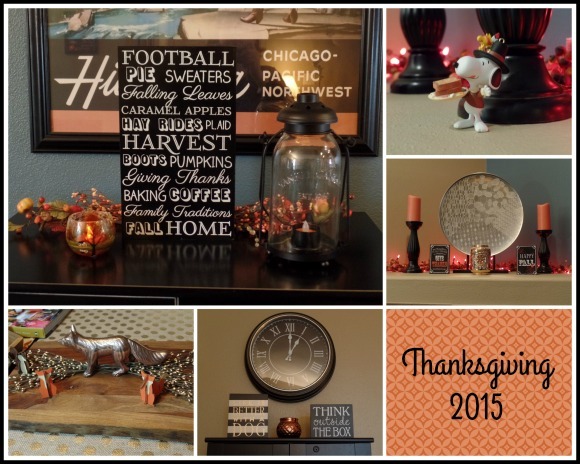 Here is my Thanksgiving Home Tour, Recipe Idea, and November favorites video if you are interested in seeing clips of my home decor, as well as checking out some of my November favorites. 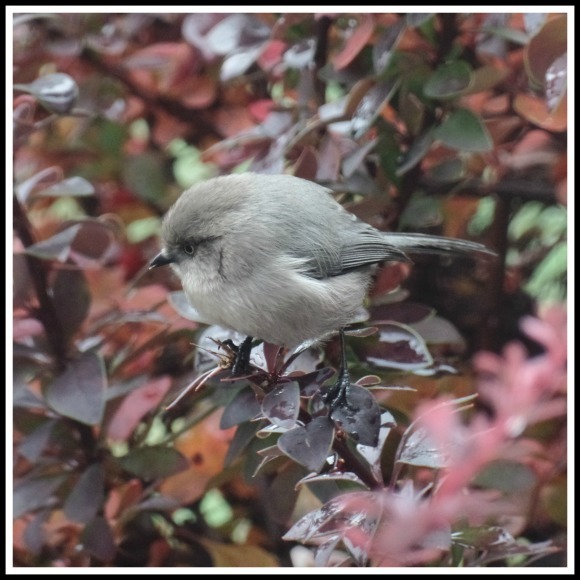 I've never heard of a bushtit, but it certainly is a cute little bird. Love all your fox decor. I bought my son one of the mugs because he loves foxes. And the little Snoopy pilgrim is adorable. The recipes sound great! Have a happy Thanksgiving! 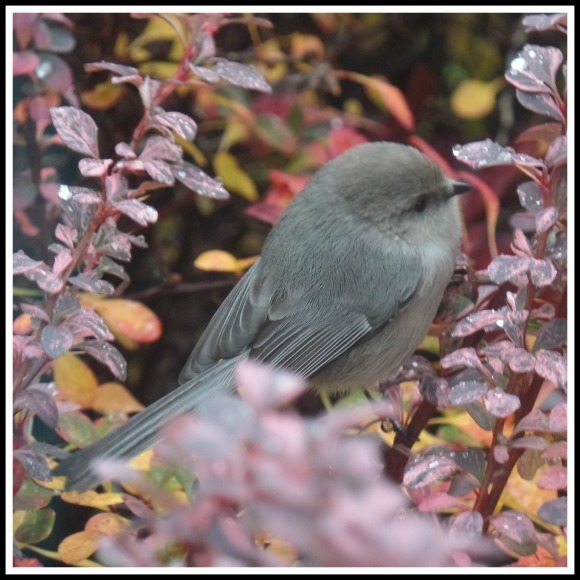 Wow, what a dear little thing that Bushtit is. So tiny. Reminds me of our native Goldcrest another teeny, delicate little bird. Love your decorations, as ever they are spot on.